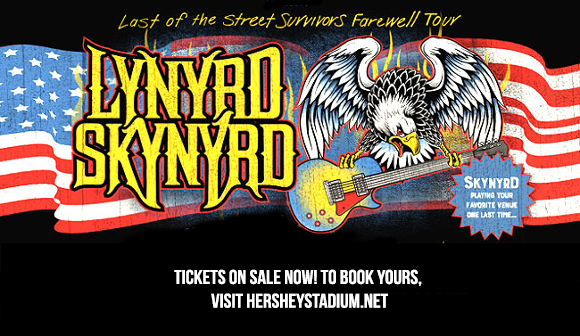 Lynyrd Skynyrd comes to Hersheypark Stadium on Saturday 28th July 2018! The legendary group are taking to the stage ONE LAST TIME and you lucky people can grab the chance to be a part of this special show. Tickets are NOW on sale for this groundbreaking, unforgettable farewell performance – there's no time like the present to grab your tickets and get excited for the Summer! The band behind some of the biggest tracks in music history songs that have changed life as we know it! Such as "Free Bird" "Sweet Home Alabama" and more! Of course is can only be the legendary – Lynyrd Skynyrd known for their massive influence and part of the Southern rock genre during the 1970s, these guys have been a long standing group of all time. Now for half a century, Lynyrd Skynyrd have been performing all around the world and sharing their music since their very first year all the way back in 1969!! With a gap for many years, in 1987 the group reformed with it's surviving members and have continued to produce and perform ever since. Gary Rossington, Johnny Van Zant, and Rickey Medlocke, who first wrote and recorded with the band from 1971 to 1972 before his return in 1996. And founding member Larry Junstrom, along with 1970s members Ed King and Artimus Pyle, remain active in music but no longer tour or record with the band. Michael Cartellone has recorded and toured with Lynyrd Skynyrd since 1999. To this date, they have a whopping 28 million record sales – this is a figure that is in the United States alone! It's hard to find a person that doesn't know songs such as Sweet Home Alabama. As each and every one of their tracks has a catchy guitar riff, chords and anthem sounding chorus! Come and sing along for the last time as their 2018 dates take place… tickets on sale above!